Broward County Supervisor of Elections Brenda Snipes has taken her final bow in a storied career of election mishaps. Brenda Snipes’ spokesman confirmed Sunday she has tendered her resignation following another episode of errors and confusion during the Nov. 6 midterm election, NBC 6 Miami reports. 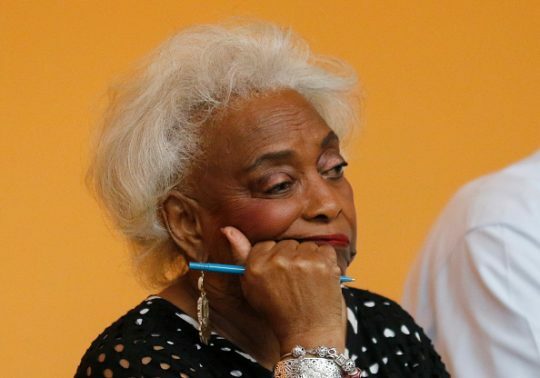 Snipes’ tenure helped to make Broward nationally known for election chaos, and most recently she was found to have broken the law by destroying ballots earlier than allowed. Burnadette Norris-Weeks, an attorney for the Supervisor of Elections Office, said Snipes’ resignation will be effective Jan. 2, although a former spokesman told the Sun Sentinel it would be Jan. 5. It is clear her resignation was sent to Tallahassee. "It is true. She did send it," Norris-Weeks said. It is likely that Governor-elect Ron DeSantis (R.) will appoint Snipes’ successor, since he will be sworn in Jan. 8. Snipes had been facing a torrent of criticism for her office’s handling of the midterm election, in which her office was far behind in counting ballots that were cast and also failed to submit the results of the recount on the state’s deadline. Gov. Rick Scott (R.) blasted Snipes, a Democrat, accusing her of "incompetence" and suggesting there "may be rampant fraud" at play to steal the Senate election from him. Earlier Sunday, Scott’s fears were finally put to bed as official results showed him leading, and Sen. Bill Nelson (D.) finally conceded defeat in an election close enough to trigger two recounts. The results also showed DeSantis winning the gubernatorial election over Tallahassee Mayor Andrew Gillum (D.), who conceded—for the second time—Saturday night. Not only did Broward County take notably longer than other counties to count its votes, it also lost thousands of ballots that were initially counted but didn’t make it into the machine recount. Snipes took flak from Scott, Sen. Marco Rubio (R.), and President Donald Trump, along with various media figures who were bewildered by Broward’s inability to conduct the election smoothly. In addition to illegally destroying ballots in 2016, Snipes oversaw an office that had sent incorrect ballots to voters, discovered uncounted ballots days after elections, and regularly lost absentee ballots, including supposed thousands in the 2004 election. This entry was posted in Politics and tagged Andrew Gillum, Bill Nelson, Florida, Rick Scott, Ron DeSantis. Bookmark the permalink.